Additional charts S&P 500 valuation measures, P/E ratios and equity returns, and S&P 500 profit margins, among other things. 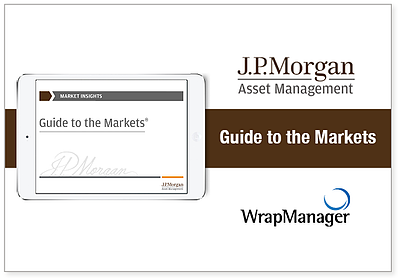 Download JP Morgan's Guide to the Markets for 64 in-depth pages of charts that review equities, the economy, fixed income, international markets, alternatives and investing principles now. To learn more about JP Morgan and other Money Managers, give us a call at 1-800-541-7774 or contact us here to speak with one of WrapManager's Wealth Managers.